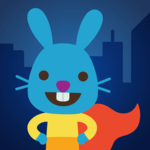 Sago Mini Superhero is a fun and entertaining app that allows the child to pretend to be a superhero helping animals around town. The child flies the superhero rabbit up, down and around the buildings. As the superhero rabbit flies, he interacts with the people and objects he encounters. There are special places revealed by a little sun. When he lands here, the rabbit will complete a preset activity, such as rescuing cats from a tree or helping a baby bird back into his nest. The hero can fly up in the sky or underground. The open ended play allows the child to have different experience each time he plays the game. Sago Mini Superhero is highly recommended for young children. It is an excellent tool for stimulating language skills, both receptive and expressive skills. It is also a good reinforcement of skills learned in therapy.